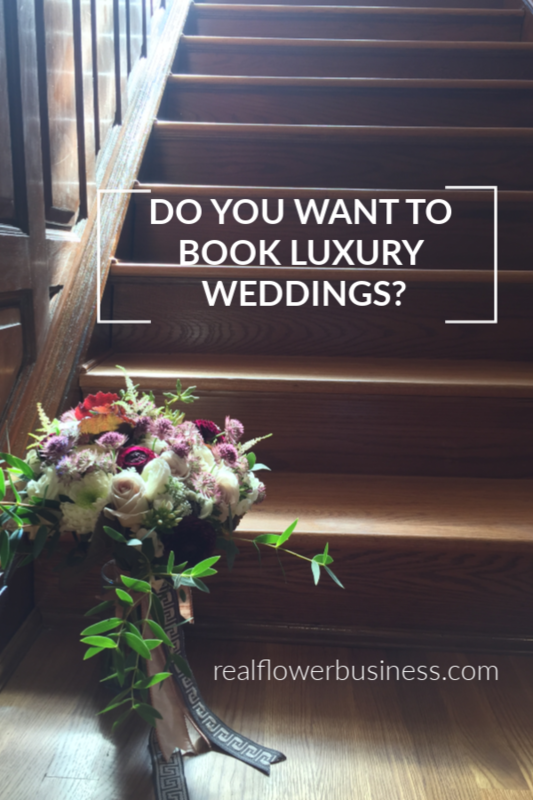 Should you book more luxury weddings? If you want to have a successful floral design business do you have to focus on luxury weddings? I’ve seen ads that claim to teach florists how to “book more luxury events” and “make a six-figure income”, but the truth is that most florists don’t service luxury events (or pay themselves a 6-figure salary!). In fact, many florists aren’t fully equipped to do luxury events (staffing, space constraints, rental inventory on deck, etc.) so if you don’t do “luxury weddings”, you’re actually totally normal! As I learned in my youth, “Mo money, mo problems”; that can certainly apply to luxury floral gigs, too. The entire weekend thru Sunday afternoon…. The sheer quantity of work involved in creating lush centerpieces for 200+ guests and hanging installations and an elaborate arbor or chuppah can be more than just a bit overwhelming for any floralpreneur®. For example, if you don’t have a “go-to team” you can count on, then pulling off a large-scale event may be particularly difficult to execute. You need a reliable team of professionals on deck who understand your expectations in order to flawlessly deliver a ton of details in a short amount of time. Without extra hands you can trust to help lift and schlep and climb ladders, “luxury weddings” can make you feel like you’re in over your head. Pro Tip: Find your sweet spot! To have a “successful business”, your work should not only make you money, but it should make you happy & fulfilled, too….in other words, you shouldn’t dwell in a constant state of overwhelm or aim for goals that aren’t truly in your heart. Most of my weddings are in my “sweet spot” which is anywhere from $3,500-$6,500 range. They’re “big enough” to make it worth my while to block off my time and spend days designing for their event, yet I don’t need a floral army to meet my obligations and I can probably fit it all in my minivan for delivery without renting a larger vehicle. I can appreciate the thrill and challenge of a larger event, but luxury weddings aren’t my bread and butter. Once I involve multiple vehicles, multiple helpers, multiple hours of on-site installation over multiple days, the commitment from me goes up and the commitment from the client goes up as well (both financially and in regards to overall expectations). If you’re intimidated by five-figure floral budgets and high-expectation clients or you’re simply not interested in providing extra time and attention and multiple on-site meetings to high-end clients, then “luxury” events may not be your dream gig. And that’s OK. Determine the price points that work best for your business goals so you’re working in your sweet spot. You won’t find a florist on this planet who’ll deny that what we do is hard work, so while turning a profit in your business is a necessity (and you should know your profit margin on every event! ), your love of flowers and floral design is also an important ingredient for sustained success. I’m not actually looking to grow a large scale floral design company. I like the work I do now. I love floral design and specifically, I love my small, home-studio that focuses on wedding flowers. I consider myself a successful business owner; I’m happy with what I’ve built and continue to grow. If you don’t LOVE floral design in your heart, you’re going to have a lot of very long days at work. 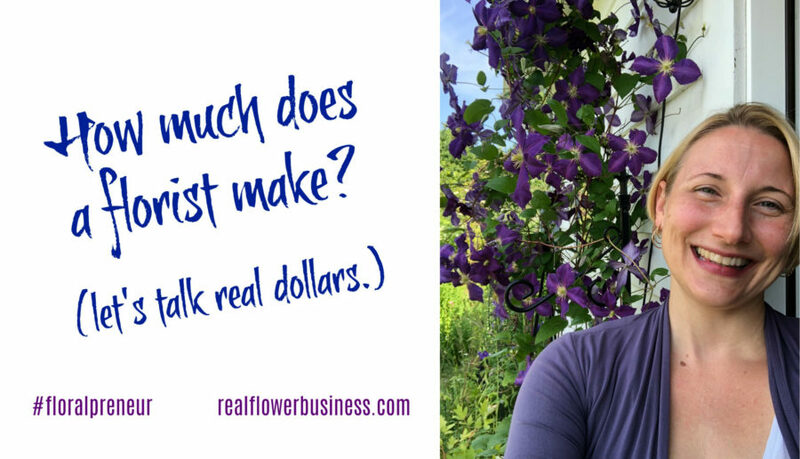 Let’s talk profit margins in your flower biz. As a solo-business owner, who only hires occasional freelancers and weekend delivery & set-up assistance, there are some limitations on the amount of work I can take (and that creates an income cap!). For example, I’ve done 4 weddings in a holiday weekend before….and it was hell…..so I learned to never do that again! You don’t have to book luxury weddings to be a successful floral designer. Do what you love! Deliver what you promise. And keep doing beautiful work! Want to book more weddings more quickly & Save $20 Off my Wedding Templates? (click here).